Those of you that follow gaming news even semi regularly are probably aware that there are some serious allegations being leveled at Star Citizen, its developer Cloud Imperium Games (CIG), and Roberts Space Industries (RSI), a subsidiary of Cloud Imperium Games. It gets a little more murky when you take into account the allegations fired back from CIG towards The Escapist, who posted the article with said allegations using nine anonymous sources (two were only used to corroborate evidence), denying what is contained in that article and asserting unethical practices on The Escapist’s part. Further complications pile on when you consider Derek Smart’s own allegations towards Star Citizen, which more or less boils down to his assertion that Star Citizen is nothing but a long con. Star Citizen started its journey on Kickstarter, asking for $500,000 and receiving $2 million. From there, they have continued their crowdfunding campaign, which recently reached over $90 million and nearly 1 million backers. With stretch goals all the way to the $65 million mark, though nothing since, Star Citizen promises a lot of different features. Led by the vision of Director Chris Roberts, Star Citizen is described as being a space adventure with a massively multiplayer persistent universe featuring both FPS and first-person space combat dogfighting. That’s the loaded one sentence version of what Star Citizen is, but there is a whole lot more to the game in the details, which is why many consider it to be one of the most ambitious games of all time—some considering it too ambitious. Criticisms towards Star Citizen, their funding, seemingly slow development, never ending crowdfunding, and more have been around for some time, with pieces published at various publications. All of this started to get more and more attention when Derek Smart started posting lengthy blog posts criticizing the development of Star Citizen, going so far as to suggest illegal activity. The response from RSI basically said that everything Smart is asserting is utterly false and without basis. Smart’s lawyers sent a response back reiterating their demands and defending the allegations against Smart in RSI’s response letter. The saga continues, of course, with neither side budging and both sending allegations between the other. The important things to note here are Smart’s accusations and some of his sourcing (getting to that in a moment), as they will be awfully familiar later—so will CIG and RSI’s response to those similar accusations. One of Smart’s biggest arguments of Star Citizen‘s impropriety comes in his examination of its Terms of Service. In version 1.1, the ToS said that CIG would issue refunds if the game was not delivered within 12 months of the original estimated delivery date of November of 2014. The current version, 1.2, created in February of 2015, now states they will not give refunds until after eighteen months after the estimated delivery date. Maintaining the original estimated delivery date, that gives CIG until May of 2016 until they will refund backers. To sum up, Smart asserts that CIG and RSI have no intentions of releasing a finished product, nor do they have the ability with incompetent leadership; they have created a system to continually receive money without delivering any promises; they have committed illegal acts in changing the product Kickstarter backers originally backed into something else, while not allowing refunds, among other illegalities; and so on. Smart had inklings of course before he wrote his first post in July, but in a comment he said they were nowhere near the scope they are today until he spoke to some people associated with Star Citizen. The comment goes into how his eyes were opened to the development of Star Citizen, specifically how Chris Roberts and Sandi Gardiner have run the company, creating an uneasy and unhappy environment for development. There are many, many thousands of words more to all of Smart’s discussions, allegations, evidence, sourcing, etc., so if you would like to know more about what he claims, take a look at his blog. Enter The Escapist. On September 25th, The Escapist published an article entitled “Eject! Eject! Is Star Citizen Going to Crash and Burn?” by Lizzy Finnegan. The article more or less goes through and sums up Smart’s grievances towards Star Citizen, with some additional information about Chris Roberts’ past as founder and CEO of Digital Anvil, leaving soon after the company’s first release and acquisition by Microsoft. One quote standouts from that article, “Roberts admits that he was a bit too ambitious when he founded Digital Anvil in 1997, and stated that his company ‘wanted to develop not only hugely ambitious games, but too many hugely ambitious games. '” The other bit Lizzy included was about Roberts’ foray into independent film publishing, which ended in a settled lawsuit from actor Kevin Costner. This then brings us to the article that caused all of the recent discussion and fiery responses from CIG’s lawyer. Less than a week later on October 1st, Lizzy Finnegan wrote and The Escapist published another article about Star Citizen, this time speaking to nine anonymous employees, seven of which were no longer with the project, two that were, and of the nine only two were used for corroborating evidence and not quoted in the article—they did not divulge their identities whatsoever. Sandi allegedly informed employees not to hire people if too much time had passed since their education, putting them at around 40 years old, since they would be harder to fire and allegedly used race as a hiring factor, refusing to hire someone because she was black. Several matters were taken before HR, but employees received little help. Employees always felt on edge around Sandi and Roberts, both of which allegedly routinely insulted employees, to the point that one of the sources said they would often gather four or five people to review an email before it was sent to Roberts so that there wasn’t anything that may upset him. Another mentioned Roberts was unable to control his temper and had no problem making a scene. Roberts and Sandi used company funds for private expenses, such as paying for the house they live in, vacations, travel for Sandi to go to movie auditions, and more along those lines—the sources describe a lavish lifestyle funded by the crowdfunding campaign. One source alleged that company funds are being used to fund the development of a crowdfunding platform. Some sources were concerned with irresponsible spending and mismanaged money, claiming large portions of the game have been stripped down to be redone with no gain. They also see hiring Hollywood actors to do voice over work on commercials and in-game voices is not worthwhile. Many of the sources claim there is only about $8 million left from crowdfunded funds. ” Chris Roberts wants a certain game – practically a movie – and doesn’t want to compromise on anything but staff,” CS6 said. Several sources claim the Austin offices are closing, even though CIG claims this to be untrue. Lizzy says one of the most common things discussed by the sources was the lack of progress on Star Citizen. One source said they weren’t making a game but commercials, and another said they were always building towards the next event for a flashy demo, rather than making the game itself. Many of the sources felt guilt, like they were part of some con and wanted to get out because of the feeling. The article ended with mention that none of the sources could agree on whether or not a game would actually truly be coming out. There may be some missed points, but those are the larger, more serious allegations levied at Chris Roberts and CIG. If you read through some of Derek Smart’s posts, and even looked at the extremely brief summary given above, some of these may seem familiar already. That’s something to note for later. The purpose of laying out all of the allegations from The Escapist article above is to understand how much information there is to parse, how serious many of the allegations are, and to show the types of claims the sources have.The allegations themselves are not the biggest part of the issue/story here; rather, they are largely just used to point out the fact that serious allegations were levied towards Star Citizen. That’s important to note, as what follows will be a look into CIG’s claims of impropriety on The Escapist’s part—that they published any allegations at all. If you take a look at the article now, you will see that in several spots The Escapist has responses from Chris Roberts in there. This is where the allegations of poor journalistic practices towards The Escapist begins. The original article ran with no responses from Roberts in there at all, though in an article discussed below, The Escapist notes his responses were added in soon after publication. On Ocotber 1st (after The Escapist article was published) Roberts posted a long response (below the update) on the Star Citizen site, much of which gets to the point that calling it “railing against” Derek Smart and someone on Twitter going by “Bandit” (someone who has also spent a decent amount of time digging into Star Citizen and posting about it on Twitter) is not editorializing, but Roberts also has many concerns with The Escapist as well. Derek Smart plays a part in that Roberts alleges that Lizzy Finnegan just parroted Smart’s allegations, evidenced by her directly referencing Smart in her original article and her relationship with “Bandit” on Twitter, consistently retweeting one another. Further, Roberts alleges a more significant connection between Derek Smart and Lizzy Finnegan, with Bandit thrown in as well. Roberts starts off his response with that discussion, claiming, while The Escapist denied it, the article more or less just copied the same claims from Smart’s blogposts, which comes with the implication that Smart may have been one of the source and/or some of the sources may be the same Smart has used in his posts. Roberts uses some evidence from Twitter to create the connection, which you can read through yourself and decide if you find it could be true. This is more or less the “conspiracy” that the eventual demand letter from CIG, spoken about at the end of the article, alleges. In other words, that Lizzy and Derek—and others possibly—worked together to bring the article together and against Star Citizen. However, back to The Escapist. 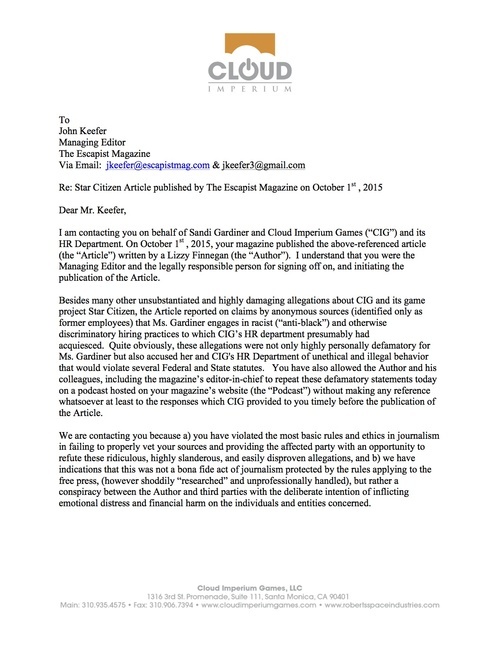 One of Roberts’ biggest points of contention was the fact that the article was rushed through, giving him or anyone else at CIG less than 24 hours to respond to the allegations bullet pointed in the email asking for comment (displayed below Roberts’ response). At the bottom of his update you will see his response to those bulleted points, which more or less comes down to him denying each one and elaborating on why that accusation was false. In an article that is already incredibly long, I won’t go into them, but they are there for you to read. A common thread throughout many of the responses, though, is his skepticism towards the veracity of the sources—in many cases pointing out certain information they revealed they could not have known, if true. Questioning the veracity of said sources is the key element to the whole issue between Star Citizien and The Escapist. Were the properly vetted? What evidence did they have? Should The Escapist have published their opinions? Where did the sources come from? Later on October 1st, Reddit user MisterBurkes posted on the starcitizen subreddit that he had uncovered the origin of the sources in The Escapist’s article. A site called Glassdoor allows you to create an account, which is not then verified, where you can leave a “review” for a company. Six reviews were posted on Glassdoor between September 25th (Lizzy’s first article) and October 1st (the article with the anonymous sources), which were all overwhelmingly negative (1, 2, 3, 4, 5, 6). MisterBurkes and others allege that this is where Lizzy found her sources, and if you read through the reviews, there are certainly many common complaints and criticisms. Only one of the reviews has any direct quotes in Lizzy’s article, which are quotes about Sandi not wanting to hire someone because they were black or over 40. While it’s murky at best, we don’t really know where all of the sources come from. However, it is not unreasonable to think said sources both spoke to Lizzy and then posted to Glassdoor. In a response to someone asking her about the Glassdoor reviews, Janelle Bonanno, The Escapist’s Gaming Editorial Director, says they spoke to the sources before the reviews went up. The Escapist, however, is sure that the sourcing did not come from Glassdoor. In a response posted October 2nd to the rather large community backlash they received, which was heightened when the Glassdoor reviews came to light, The Escapist posted an article detailing their interactions with the sources and the vetting process. Initially contacted Lizzy via phone on September 26th, agreeing to chat with her later. Followup: Contacted by Lizzy via phone on September 26th. Visually verified via Skype (pictures on Linkedin profiles or other images compared to Skype to verify identity). Contacted Lizzy through email on or before September 27th. 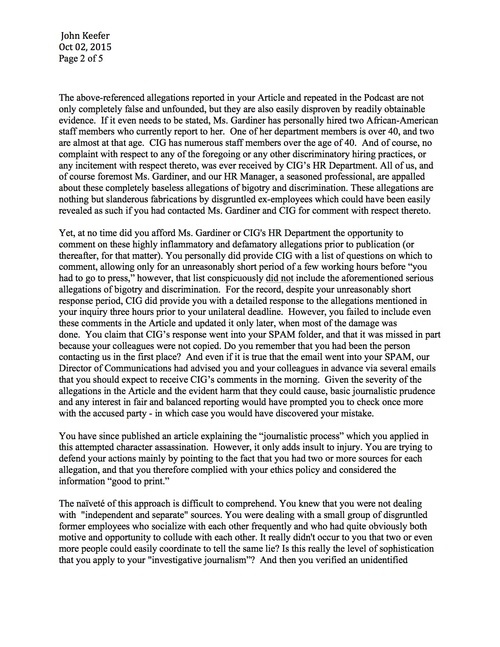 Emails cleared by EiC, Publisher, and legal department, which allowed for following up with personal contact. Followup: Contacted by Lizzy via phone on September 27th. Followup: Contacted by Lizzy via phone on September 28th. Both current employees at Cloud Imperium Games. Did not disclose their identity and contacted Lizzy through Lockbin on September 27th. Either CS2, CS6, or CS7 did not give his name, but verified employment with a Cloud Imperium Games ID and pay stubs. This seems to clash with the statement that all of these three were verified via Skype. It could mean the ID and pay stubs were seen via Skype. All of the sources quoted had their identity verified via Skype through comparison with known photos of who the sources claimed to be. Additionally, each quoted source had personal contact with Lizzy through the phone. Chris Roberts’ response to me was at 9:10 a.m. almost three hours before publication time. Unfortunately, the response ended up in my spam folder, as it came in unformated and the pictures did not load. Since Roberts did not copy Lizzy or the Editor-in-Chief, who were on my original email to CIG PR head David Swofford, they did not get them and there was no back up to ensure someone saw it. Swofford emailed me at 12:40 – after I had sent him a link to the story – asking if I had received Roberts’ response. It was then that I checked my spam folder, found the response and forwarded it to Lizzy to integrate into our story, minus any personal attacks on the sources. I called Swofford at 1:02 p.m. to personally apologize for the oversight and let him know how we would be using the response in the story. Roberts’ entire response on the official site showed up roughly 10-15 minutes before we updated our story on the site. What that means will vary from person to person. The very act of reaching out at all to specific people may be enough to fulfill that, while others may require a “reasonable” amount of time be given before comment, which itself can be up for debate. Then there is the consideration of whether or not a story has urgency, which The Escapist certainly felt here. In any case, it comes down to the fact that Roberts’ felt he was not given enough time, and The Escapist felt they were being at least slightly generous in what they gave him. A final point to mention, which is up for all of you to decide, is whether or not how sources where vetted was sufficient. It is worth questioning whether comparing images from Skype to that of those found around the Internet is enough to go forward. Later mentioned in a forum post, however, was that The Escapist had lawyers verify the identity of the sources themselves. It is also worth considering what effort went into verifying the individuals had been employed at CIG, though one would assume the lawyers did that. 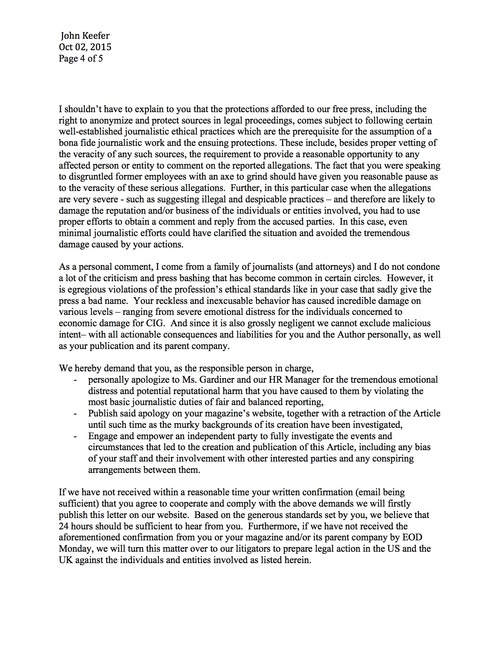 We are contacting you because a) you have violated the most basic rules and ethics in journalism in failing to properly vet your sources and providing the affected party with an opportunity to refute these ridiculous, highly slanderous, and easily disproven allegations, and b) we have indications that this was not a bona fide act of journalism protected by the rules applying to the free press, (however shoddily “researched” and unprofessionally handled), but rather a conspiracy between the Author and third parties with the deliberate intention of inflicting emotional distress and financial harm on the individuals and entities concerned. A quick reminder before moving on is that the “conspiracy” referenced here is likely what Chris Roberts was getting at in his original response to The Escapist, alleging Derek Smart, Lizzy Finnegan, “Bandit,” and possibly more detractors working together. You were dealing with a small group of disgruntled former employees who socialize with each other frequently and who had quite obviously both motive and opportunity to collude with each other. The evidence given that this may have indeed been the case was the information they received from other publications that the story had been “shopped” around. That these other publications had been offered the stories but ultimately decided not to pursue them. The letter mentions that this calls into question whether or not the sources independently contacted Lizzy and whether or not much of it can be trusted at all. One point that many fans and backers of Star Citizen have grabbed onto is the information included in the letter that CIG does not issue company ID cards at any of its four studios. In a tweet, Lizzy Finnegan discusses the ID that was shown to her, where someone asked if one from a Star Citizen video was the same as the one shown to her as evidence of their identity. 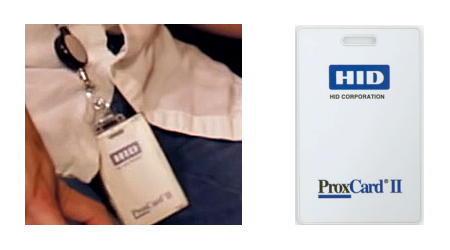 The card appears to be a HID Prox Card II, which is a common security card used by many businesses. Cloud Imperium Games employee Ben Lesnick sent a joking tweet with his “ID card” as well, which seems to confirm that the HID Prox Card II is what CIG does indeed use. While that doesn’t show the back, if you watch the video linked to Lizzy, you will see the one there flipping around sometimes, where the background is completely white. One thing that does seem certain, though, is that CIG does indeed use that card, and it is possible that Lizzy was shown one and mistakenly took it to be some form of identification, as she also mentioned the identifying information was blacked out. That would imply that, in this case, there was no malicious intent, but that it was a mistake—if this is indeed the card she saw, which as the tweet above shows, she is not entirely certain. While this is the “gotcha” moment for many arguing against The Escapist’s article, the fact remains that identities were still verified via Skype and by lawyers—though, one has to wonder how the person not giving any personal information was verified, even though they also provided pay stubs. One also has to question if the ID card was used as evidence that the individual had been a past employee. Back to the letter. It then mentions the Glassdoor reviews, stating that whole passages were lifted and put into The Escapist article. As mentioned above, that is not entirely true, as there are only two direct phrases linked to only one source. It also mentions how closely the reviews were published near the date of the article being published. And because of the severity of the allegations, The Escapist should have made more of an effort to allow for comment from the affected parties, which as Roberts argued in his original response, and is argued here, was not enough time to do so. Due to those failings, the letter argues that they do not have the right to protect and anonymize sources in legal proceedings. Engage and empower an independent party to fully investigate the events and circumstances that led to the creation and publication of this Article, including any bias of your staff and their involvement with other interested partied and any conspiring arrangements between them. 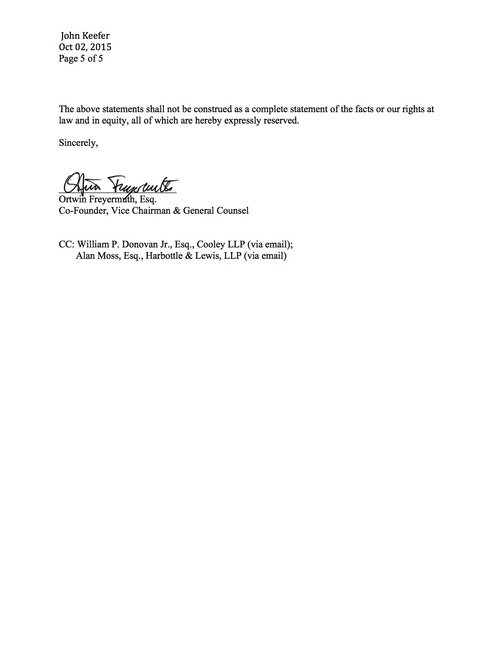 The letter ends giving The Escapist 24 hours to contact CIG to confirm that they will comply to the above demands. If they do not receive the confirmation by end of the day on Monday, they will turn the matter over to litigators and pursue legal action in the U.S. and U.K. The 24 hours has passed, but The Escapist still has until the end of today to send in the confirmation to avoid legal action. Seeing as there have been no posts to The Escapist or to the Star Citizen website so far, we don’t know if that email has been sent yet or not. What does this all mean if CIG does decide to take The Escpist to court for libel? Well if this was all a murky mess, the law surrounding the protection of sources in court proceedings, particularly those where the journalist(s) are charged with libel, are incredibly hard to decipher. 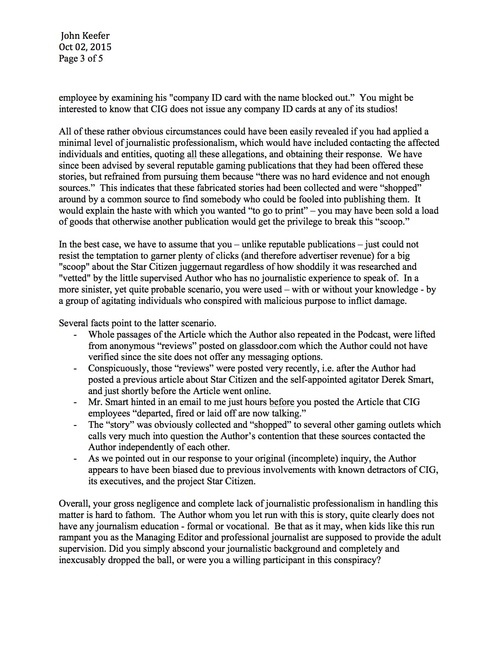 In researching, I found no instance where a journalist was forced to reveal their source in a defamation case, which is something implied in the letter above. Either the journalist comes to an agreement with the source to reveal said source, can reveal the source without the agreement (risking another lawsuit), or they can forego the right to use the sources in the trial at all, meaning that they can not use evidence obtained by said sources in their defense. Assuming The Escapist does not feel inclined to reveal any of their sources and choose the last option of not using them in their defense, what sort of case this will be really comes down to one question. Are CIG, Chris Roberts, et al considered public figures? If so, that would mean the “acutal malice” condition would come into play. That means that it would be up to CIG and its lawyers to prove that The Escapist published the allegations with knowledge that it was false, or published it with reckless disregard for the truth—in other words, did not care to check the veracity of said claims. If not they are not considered public figures and no longer have to prove actual malice. Then it just becomes a matter of proving financial loss or the potential for financial loss. However, the “actual malice” portion from New York Times v. Sullivan will still apply when discussing punitive damages. It is definitely a lot more complicated than that, and rather than make a long article longer, let’s just say that if it does indeed go through the legal system, we should uncover more of the truth behind the whole situation. If CIG wants to go through with it, they will have to show that the published statements were indeed false no matter what—in terms of actual malice, more than just minor inaccuracies. So some sort of evidence will have to be presented to prove that, which should then decide what is happening. If they are unable to do so, we can assume that what The Escapist published was largely true—at least in regards to whatever is not disproven. Of course, all of the above just now refers to U.S. case law, not the U.K.
No matter what, we are all stuck here waiting to see what happens. Either this will go to court where more information will come out, or one side will give in, retract their actions, and we will be left with what we largely know right now. This is not to assume any wrongdoing by The Escapist either, but due to the anonymity and questions swirling around the vetting process, nobody can really tell if what is there is 100% accurate—even The Escapist itself can’t be that sure. In the end, this is an interesting case study and look into journalism, ethics, the relationship between the gaming press and gaming companies, and more. Stay tuned to TechRaptor for any more developments. We should all expect some more information maybe sometime today but certainly in the coming days. This is of course all happening while we’re less than a week away from Citizen Con, which celebrates all things Star Citizen. The Escapist, notwithstanding Cloud Imperium Games’ notice and posting, stands by its coverage of Star Citizen and intends to continue to investigate the developing story. Since publishing our original stories, we have been contacted by, and are currently interviewing, additional sources corroborating a variety of the reported allegations. Additionally, if Mr. Roberts’ offer for The Escapist to “meet the developers making the game and see how we’re building one of the most ambitious PC games first hand” remains open, we take the opportunity to accept such invitation so as to hopefully provide the public with sufficient information and opportunity to vet such sources’ allegations and claims for themselves. We have also communicated the foregoing directly to Cloud Imperium Games. It seems quite clear that The Escapist will not be complying with the demands sent by CIG. Now we will just wait and see if CIG will indeed pursue legal action, though one has to admit The Escapist’s resolve to stick to the story, and the fact that there seems to be more coming, would likely make CIG pause. Check back here for any more updates. What do you think of the issues between Cloud Imperium Games and The Escapist? Will this actually go to court? Did The Escapist employ unethical journalistic practices? Do you think any of the allegations against Star Citizen hold any weight?